(1)Brand new and high quantity. (2)Connect high gain RP-SMA antenna to mini PCI card. (3)Compatible with all mini PCI card or most mini PCI-E card. (4)This kit allows you to add high gain external antennas to many wireless routers that do not normally support removable antennas. (5)In most cases just open up the router, locate the connectors, connect the leads, and drill out holes in the router's enclosure for the external connector and mount. 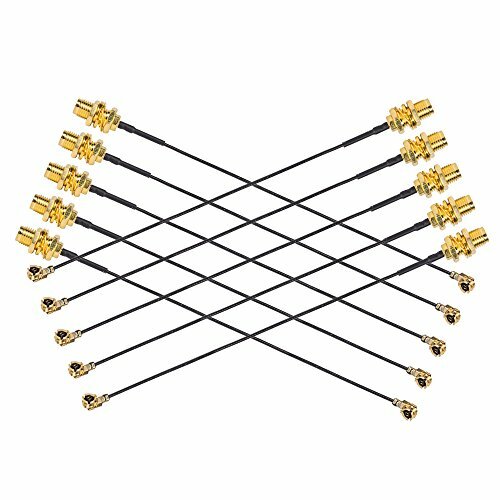 (1)The connectors are gold plated for optimal signal transfer. (2)The blukhead RP-SMA connector makes it easy to mount directly to the case or I/O shield punchout. (3)U.fl or IPEX to RP-SMA cables fit most Mini PCIe cards including, the Intel Centrino Wireless N series. (4)The pair of cables is ideal if you are using a combo wifi/bluetooth card, like the Intel Centrino 1030, that requires both antennas to be populated for both features to work or just have more then one system to build.